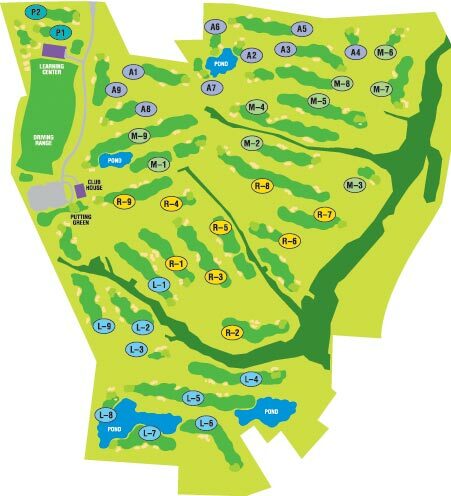 Each of the championship (par 36) nine-hole courses, The Lake, The Ridge, and The Meadow, features five tees with the 18-hole layouts ranging from 5,050 yards to 7,108 yards. Rolling fairways, tees, and greens are creeping bentgrass with large bunkers guarding putting surfaces. An ample amount of fescue is found off the fairways and greens with environmentally sensitive wetland areas coming into play throughout the course. The greens have been designed with subtle undulations to increase the challenge of play. Electric carts will travel the 8.9 miles of paved cart paths.